Our Cloud Computing Tests allow you to experience an online examination in the real-time environment. In every online test on Cloud Computing, you will be presented with Multiple Choice Questions (MCQs) which will test your skills in Cloud Computing Concepts in a detailed and comprehensive manner. In the test, each question will have 4 options to choose from. You should select only 1 correct option as an answer and then move on to the next question. Once you submit answers to all the questions, you will be given your final test score. In the Online Cloud Computing Test, for every correct answer, you will be given 2 points. There will also be negative marking of -1 for every wrong answer. So, you will have to be more careful in choosing the answers to the question in your online examination. If needed, you should skip to the next question and come back to the previous question later so that you can do proper time management for the online mock tests. 1. "Cloud Computing Practice Tests" - In Cloud Computing practice tests, there will be a series of practice tests wherein you can test your Cloud Computing concepts on every chapter separately. There will not be any time limit on these tests. So, Cloud Computing Practice Tests should be the first set of tests which you should attempt. Goto these practice tests here. 2. "Cloud Computing Mock Tests" - In Cloud Computing mock tests, there will be a series of mock tests wherein you can test your Cloud Computing concepts on every chapter separately, but there will be a fixed time limit per test. So, it is similar to Cloud Computing Practice Tests, but with an added constraint of time limits. 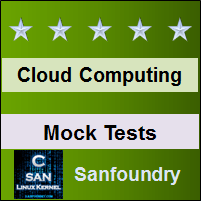 You should try Cloud Computing Mock Tests if you are appearing for any online examination soon. Goto these mock tests here. 3. 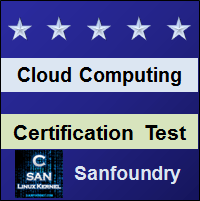 "Cloud Computing Certification Test" - Once you are through with your Cloud Computing concepts, then you should try our Cloud Computing Certification Test wherein Sanfoundry will issue a free Certificate to you if you scored either Grade A* or Grade A in Cloud Computing Certification Test. Goto Cloud Computing Certification test here. 4. 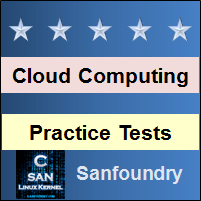 "Cloud Computing Internship Test" - If you are interested to do Internships in Cloud Computing at Sanfoundry, then you must take our Cloud Computing Internship Test. If you scored either Grade A* or Grade A in Cloud Computing Internship Test, then you are eligible for Internship at Sanfoundry in Cloud Computing. Goto Cloud Computing Internship test here. 5. "Cloud Computing Job Test" - If you are a fresher, a dropout, an experienced person and if you know Cloud Computing well and looking out for jobs in Cloud Computing domain at Sanfoundry (or our Network of Companies), then you should try and qualify our "Cloud Computing Job Test". 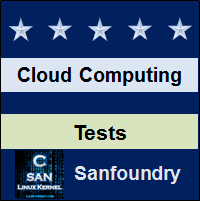 If you scored either Grade A* or Grade A in Cloud Computing Job Test, then you are eligible for a Job at Sanfoundry (or our Network) in Cloud Computing domain. Goto Cloud Computing Job test here. For every "Cloud Computing Practice Test", Total Questions: 20, Total Time: Unlimited. For every "Cloud Computing Mock Test", Total Questions: 20, Total Time: 20 Minutes. For "Cloud Computing Certification Test", Total Questions: 50, Total Time: 1 hour. For "Cloud Computing Internship Test", Total Questions: 50, Total Time: 1 hour. For "Cloud Computing Job Test", Total Questions: 50, Total Time: 1 hour. Before you get started on these series of online tests on Cloud Computing, you should learn, study and practice our collection of 1000 MCQs (Multiple Choice Questions and Answers) on Cloud Computing here. We also prefer that you should practice Cloud Computing practice tests and mock tests completely before attempting the certification test. Here is the list of online practice tests and mock tests on Cloud Computing. Each online test focuses on a "Specific chapter of Cloud Computing". So, you should try both practice test and mock test on every chapter to do a self-assessment of your knowledge (along with time-limit constraints) in every area or sub-topic of Cloud Computing. Cloud Computing Certification test, Internship test, and Job Test are mentioned at the end of this list. 1. Cloud Computing Test 1 – This set of online test on “Cloud Computing” tests your skills on Introduction to Cloud Computing, Cloud Types – 1, Cloud Types – 2, Cloud Types – 3, Benefits & Drawbacks of Cloud Computing, Attributes of Cloud Computing, Laws of Cloudonomics, Challenges & Obstacles to Cloud Computing, Cloud computing costs – 1, Cloud computing costs – 2. 2. Cloud Computing Test 2 – This set of online test on “Cloud Computing” tests your skills on Connecting to the Cloud, Cloud Computing Stack – 1, Cloud Computing Stack – 2, IaaS – Infrastructure as a Service – 1, IaaS – Infrastructure as a Service – 2, PaaS – Platform as a Service, SaaS – Software as a Service, IDaaS – Identify as a Service – 1, IDaaS – Identify as a Service – 2, CaaS – Communication as a Service. 3. Cloud Computing Test 3 – This set of online test on “Cloud Computing” tests your skills on Virtualization Technologies, Hypervisors – 1, Hypervisors – 2, Machine Imaging, Porting Applications, Capacity Planning, Baseline Measurements, Resource Ceilings, Server and Instance types, Network Capacity. 4. Cloud Computing Test 4 – This set of online test on “Cloud Computing” tests your skills on PaaS Application Frameworks – 1, PaaS Application Frameworks – 2, Google Web Services, Google Application Portfolio, Google Toolkit, Windows Azure Platform, Windows Azure AppFabric, Azure Content Delivery Network, Administrating the Clouds, Cloud Management Products. 5. Cloud Computing Test 5 – This set of online test on “Cloud Computing” tests your skills on Cloud Commons and SMI, Cloud Security, Security Service Boundry, Identity Protocol Standards, Service Oriented Architecture, Event-Driven SOA or SOA 2.0, The Enterprise Service Bus, SOA Communications, Applications in the Clouds, Application Attributes. 6. Cloud Computing Test 6 – This set of online test on “Cloud Computing” tests your skills on Cloud Service Attributes, Applications and Cloud APIs, Cloud Storage in the Digital Universe, Provisioning Cloud Storage – 1, Provisioning Cloud Storage – 2, Virtual Storage Containers, Business Process Modeling – 1, Business Process Modeling – 2, Cloud Mail Services – 1, Cloud Mail Services – 2. 7. Cloud Computing Test 7 – This set of online test on “Cloud Computing” tests your skills on Syndication Services, Communicating with the Cloud – 1, Communicating with the Cloud – 2, Collaboration Technologies – 1, Collaboration Technologies – 2, Media and Streaming – 1, Media and Streaming – 2, VoIP Applications, Video Streaming – 1, Video Streaming – 2. 8. Cloud Computing Test 8 – This set of online test on “Cloud Computing” tests your skills on Mobile Cloud, Mobile Cloud Applications – 1, Mobile Cloud Applications – 2, Mobile Web Services, Service Types, Service Discovery, MEMS, Synchronization, Context-Aware Services, Security Data. 9. Cloud Computing Test 9 – This set of online test on “Cloud Computing” tests your skills on Push Services, Amazon Web Services, Amazon Web Service Components & Services, Amazon Machine Images, Amazon Storage Systems, Amazon Elastic Block Store, Microsoft Cloud Services, Windows Live Service – 1, Windows Live Service – 2, Cloud Backup Solutions. 10. Cloud Computing Test 10 – This set of online test on “Cloud Computing” tests your skills on Backup Types, Cloud Backup Features, Cloud Data Management Interface, Open Cloud Computing Interface, Online Office Systems – 1, Online Office Systems – 2, Online Office Systems – 3, Managing and Monitoring SOA, SOA Security, Open Cloud Consortium. 11. Cloud Computing Certification Test - This set of online free certification test on "Cloud Computing" tests your skills on all areas (all chapters, topics and subtopics) of Cloud Computing. 12. 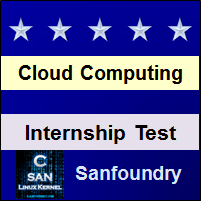 Cloud Computing Internship Test - If you scored either Grade A* or Grade A in our Cloud Computing Internship Test, then you can apply for Internship at Sanfoundry in Cloud Computing. 13. 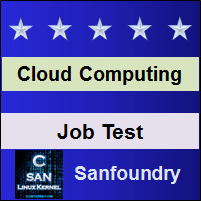 Cloud Computing Job Test - If you scored either Grade A* or Grade A in our Cloud Computing Job Test, then you can apply for Jobs at Sanfoundry in Cloud Computing domain. Best Wishes for your Cloud Computing Tests!